COULD SEVENTY BE “IT” FOR THE US? Tuesday February 21st marks a special anniversary that will most probably be overlooked. It happens to be the 70th anniversary of the United States replacing Great Britain as the world’s number one power. After fighting two world wars, Britain was faced with three major international crises all at once. The new British Labour government had already announced plans to give independence to India, after two centuries of British rule. This led to turmoil on the sub-continent between Hindus and Muslims. British troops tried to keep the peace. At the same time Palestine exploded. In 1946 Jewish nationalists blew up the King David Hotel in Jerusalem, British military headquarters in the mandated territory, killing 91 people. The first two problems occurred on British territories; the third was in Greece, where communists were trying to take over the country. At the same time, Britain was broke, following the two major global conflicts of the first half of the twentieth century. Early in 1947, economic problems at home meant that Britain could no longer allocate funds to the conflict in Greece. They decided to inform Washington to see if America wanted to take over. “This was a momentous change. For two centuries Britain had been the dominant power in the eastern Mediterranean. Now it seemed to be surrendering that role in two key countries. It is often said that Americans lack a historical sense that Europeans have, but on this occasion it was the Americans who saw the historical significance of that moment. To British ministers, battling from day to day to keep the country’s head above water, this seemed to be just a temporary retrenchment in one area. None of them appeared to see any larger implications in the decision. The American view was put in grandiloquent terms by Joseph M. Jones, who was in the State Department at the time: ‘Reading the messages, Hickerson realized, as had Henderson before him, that Great Britain had within the hour handed the job of world leadership, with all its burdens and all its glory, to the United States.” (“Picking up the reins,” Norman Moss, 2008, page 64, italics mine). The whole world did not recognize the change immediately, It was to be another ten years before it became clear to all. At the end of 1956 the Suez Canal crisis showed that London could not do anything without American support. 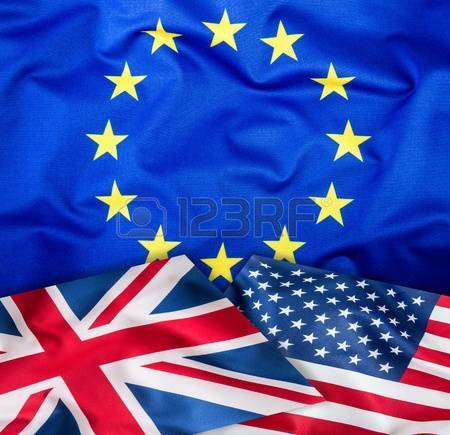 Soon afterward, the US was encouraging Britain to dismantle its empire and then to join the European Union (then the European Economic Community). That’s easier said than done. But the EU could be the world’s dominant military power for the simple reason that it is the world’s biggest trading power. That’s the main reason why the US took over from Great Britain. Economic power = military power. The US is struggling economically which is one reason why President Trump is demanding the Europeans pay more for NATO. Of course, the Europeans have their own financial problems, but they have an urgent need to protect themselves from both Russia and Islamic terrorism. If they are going to have to pay more for defense, why not go-it-alone? Especially when they no longer have confidence in American leadership. One of the first superpowers, Babylon, was predicted to last “seventy years” (Jeremiah 25:12 & 29:10), illustrating how seventy is a significant number. In Psalm 90:10, Moses was inspired to write that “our days may come to seventy years,” the lifespan of many human beings. Perhaps more significantly in the rise and fall of nations is the fact that, after seven decades, most people have forgotten everything. Few today remember World War II. Few remember that Baron Ismay, Secretary General of NATO from 1952-55, described the alliance as intended to “keep the Russians out, the Americans in and the Germans down.” In the current debate on the future of the alliance, this has been completely forgotten. Dismantle the alliance and two things will happen: 1) the American president will no longer be “the Leader of the Free World;” and 2) Germany will become the undisputed Leader of Europe (she already is economically). On the 70th anniversary of America’s ascendancy, the Munich conference saw nations actively discussing the end of America’s pre-eminence. President Trump in Washington and Vice-President Mike Pence, who addressed the conference, may see themselves as being in the lead, calling the shots, insisting on changes within the alliance; but the other member nations have the choice of forming their own military alliance, which will not be led by the United States. As with the change seventy years ago, it may take a while to fully emerge, but this is the direction we are heading in. On Sunday, Germany’s Chancellor, Angela Merkel, announced she is seeking closer ties with Russia to bring about the defeat of ISIS. In 1914, the German and Austrian empires went to war with the British, French and Russian empires. Germany was one of two in a world governed by five. The Germans lost. They repeated the same mistake in World War II, when Germany and Japan were the two, in a world still governed by five. The three opposing powers were Britain, America and Russia. Again, the Germans lost. The five major powers right now are the EU, China, the United States, Japan and Russia (a great military power, but not so great economically). The US remains in alliance with the countries of the EU and Japan, making it one of three in a world governed by five. If the EU separates from the US, that will reduce America to being one of two. This all may seem incredible with almost daily news of set-backs in the EU. France and Holland may leave after elections early this year; Greece and Italy have serious financial problems, which may affect the euro. But the fact remains that Germany dominates the continent and Germany is putting together a European military force to rival America’s. The Munich security conference showed the will is there, boosted considerably by the change of administration in Washington. Daniel 2:21 says that God is behind the rise and fall of nations. “And He changes the times and the seasons; He removes kings and raises up kings.” It could be, that after seventy years, the American Era is coming to an end. Munich this weekend showed that many want to see that happen. Something to think about as the US passes its seventieth anniversary! September 11th will long be remembered as the date of a major setback in the struggle between Islam and the West. September 11th, 1683, that is. The forces of the Ottoman (Turkish) Empire had continued their expansion into Europe and had arrived at the very heart of Europe, Vienna, the capital of the Austrian Empire. They were met by a combined force of Austrian, French, German and Polish troops, an alliance of Catholic emperors, princes and kings. Together, they stopped the Islamic takeover of Europe. Over the next two centuries, Muslim forces would be pushed back into modern day Turkey, which has a small foothold in Europe, but not much else. Mindful of their defeat, Muslims significantly chose the same day to perpetrate 9/11 exactly fourteen years ago. This time, they scored a victory and hope to go on to bring about the Islamization of the western world. After 9/11, President George W. Bush launched an attack on Afghanistan, commencing the longest conflict in American history. This was followed by a war in Iraq. The negative consequences of these two wars remain with us and are likely to continue indefinitely. Amazingly, after the terror attacks on 9/11, the first new president chosen by the American people was the first one with definite Muslim connections! Refusing to allow members of the Administration to use terms like “Islamic extremism,” most Americans remain clueless as to the seriousness of the threat Islam is once again posing to the western world. Multiculturalism is another factor that contributes to this blindness, as western nations welcome hundreds of thousands of Muslim refugees into their countries. Ancient Rome suffered many setbacks before it finally fell, but the last blow came from the new religion of Islam, which swept all before it. We now see history repeating itself. Michael Morrell, author of “The Great War of Our Time,” a book that helps us understand the very serious threat from militant Islam, was interviewed on CBS Thursday morning. Mr. Morrell is a former Assistant Director of the CIA. In his interview he was asked how the fight against extremism is going. He replied that there are three battlefields. One is a military battle in Iraq and Syria. Here, he said, we have a “stalemate.” The other two are the ideological battle to win the hearts and minds of young people in the West; and the battle against other militant organizations around the world linking up with ISIS. These two, he said, we are losing. In other words, we are not doing well against this very serious threat. One reason for this is that intelligence reports are being doctored to make it look as if the US is winning against ISIS. A report on this appeared in today’s Daily Beast. He also discussed increasing Russian encroachment into Syria. Building an air base, with a view to making air attacks on behalf of Syria’s President Assad. The flow of Russian arms over Bulgaria and Greece has now been stopped, but Russia can still send arms via Iran. Moscow and Tehran are working together to keep Assad in power. Although there are only 16 months left of the present Administration, there is no guarantee of any improvement under another. Political correctness has made it very difficult for anybody to see clearly the threat from militant Islam. 9/11 in 2001 was just the start of the latest Islamic push against the West. 40 And at the time of the end shall the king of the south push at him: and the king of the north shall come against him like a whirlwind, with chariots, and with horsemen, and with many ships; and he shall enter into the countries, and shall overflow and pass over.” (Daniel 11:40). This prophecy is about a powerful Islamic leader who “pushes” against the King of the North, a revived Roman Empire. Interestingly, in the midst of the migrant crisis, where hundreds of thousands are fleeing Islamic lands and moving into Europe, there are increasing European calls for a united effort to deal with this crisis. The root of the crisis is the Syrian civil war. Russia is increasingly involved in the conflict, which means it will go on even longer. It’s also possible that many of the refugees are being sent deliberately by ISIS into Europe, giving them a far greater advantage than they ever had in 1683. In the last hour, Saudi Arabia, which has taken no refugees from Syria, announced it will help those fleeing to Germany – by building 200 mosques in which they can worship. This will, of course, advance the cause of Islam even further. Israeli Prime Minister, Benjamin Netanyahu, was in London this morning where he told British Prime Minister David Cameron that the “Middle East is disintegrating.” The region remains the world’s most dangerous neighborhood. Recent developments and increasing threats pose real dangers for the West in general and Israel in particular. The Middle East and Europe are still at the center of world events, just as they were on September 11th, 1683. I doubt this was true. Pat Buchanan was likely more correct when he said on PBS’s McLaughlin Group that the US was “absent” and “irrelevant” in the Ukraine’s crisis. Pivotal players in the Ukrainian situation were neighbors, Russia and the European Union. As more than half the population of the eastern half of Ukraine speak Russian, there is a lot of support for Russia but the western half of the country, until a century ago a part of the Austrian Empire, looks west and wants to join the EU. It’s not just language and history that divide the two halves. Religion is another factor, with the Russian half Eastern Orthodox and the western half Roman Catholic. The pro-Russia / pro-EU division is not the only problem that divides. There is a great deal of anger amongst the demonstrators about the level of corruption in Ukraine. As with demonstrators in many countries, economic deprivation is a major driving force. What the EU represents for many is the hope of change, an opportunity to make a complete break with the Russian-Soviet past. The EU provides an opportunity to secure democracy and prosperity. A report just over a week ago showed that the EU itself has become very corrupt. Perhaps not as bad as Ukraine but in some EU countries there’s a very high level of corruption. The Mediterranean countries got a special mention, Portugal, Italy, Greece and Spain, sometimes referred to collectively as the PIGS. 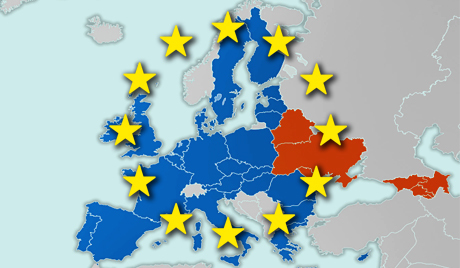 If and when Ukraine gets to become a full member of the EU, the country will not be another Germany. It will rather be one of the PIGS, heavily indebted to Germany and dependent on handouts from the wealthier members of the European club. Austerity is likely to be in force for some time. If Russia Today, a 24/7 news channel free over the Internet, is accurate, Ukraine could also be a negative influence on the EU. RT claims that many of the rebel leaders are members of extreme right-wing movements. A number of European countries are seeing a rise in extreme right-wing parties. A victory for rightists in Ukraine would encourage the same elsewhere. It should be noted that, in World War II, many western Ukrainians were pro-Nazi. Additionally, there is a very real threat of separatism along ethnic and linguistic lines. If the Russian-speaking, Orthodox, Eastern Ukraine breaks away from the Catholic, Ukrainian-speaking western half, it could encourage other separatist movements in Europe. It’s a mistake to assume that the fall of Ukraine’s pro-Russian President Yanukovych solves everything. It is rather the beginning of a very uncertain future. There is a possibility that Russia will move in militarily to protect its own citizens. They may also claim the Russian-speaking eastern half of the country. A Russian military intervention would be quick and would likely boost Putin’s stature at home, already considerably boosted by the completion of a successful Winter Olympics in Sochi. It would be similar to the Russian war against Georgia in 2008. If Russia does not intervene and Ukraine is free to join the EU, 15 billion euros in aid should arrive soon. That’s $20 billion dollars – but Ukraine will be like Greece, beholden to Germany, subject to a long period of austerity that could build resentment and boost the extreme right even further. It may be months or even years before we see the full consequences of the latest developments in Ukraine. It will be a while before we see clearly who the victors are from the upheaval that has just taken place. On the one hand, we see regular articles on how the EU is falling apart; on the other we see Ukrainians willing to die to join the organization. The battle between the Ukrainian protestors and the pro-Russian government in Kiev gets worse by the day. What will be the end result? If the opposition succeeds and Ukraine joins the European Union, the country, at 233,062 square miles, will be its biggest member. (If Turkey eventually joins, it will slide to second place.) It would also change the center of gravity, moving the parameters of the EU further east. The EU is protesting the treatment of the demonstrators, as is the US. The EU does not have the military power to take on Ukraine, which is backed by a seemingly resurgent Russia. But it does have economic power – and more of it than Moscow. Sanctions imposed by the EU could have a profound effect on the Ukraine. Russia is buying Ukrainian support with aid paid for from its oil revenues. But the EU is the world’s biggest trading bloc and carries a lot of economic clout. It’s going to be interesting to see who comes out on top. The Ukraine itself is divided. The western half of the country was a part of the Austrian Empire until World War I, so naturally leans toward the West. The eastern part was ruled by Czarist Russia and leans east. Russia has strong emotional and historical ties with the country going back to 988 AD when Kiev’s leader converted to Christianity and chose the Byzantine Eastern Christian rite over Roman Catholicism. Russia continues to follow this religious system, still seeing itself as the Third Rome. Germany and Russia fought over Ukraine in both world wars. This time, there is no physical fighting except for the violent demonstrations in Kiev. But the country could be headed for civil war, which won’t benefit anybody. 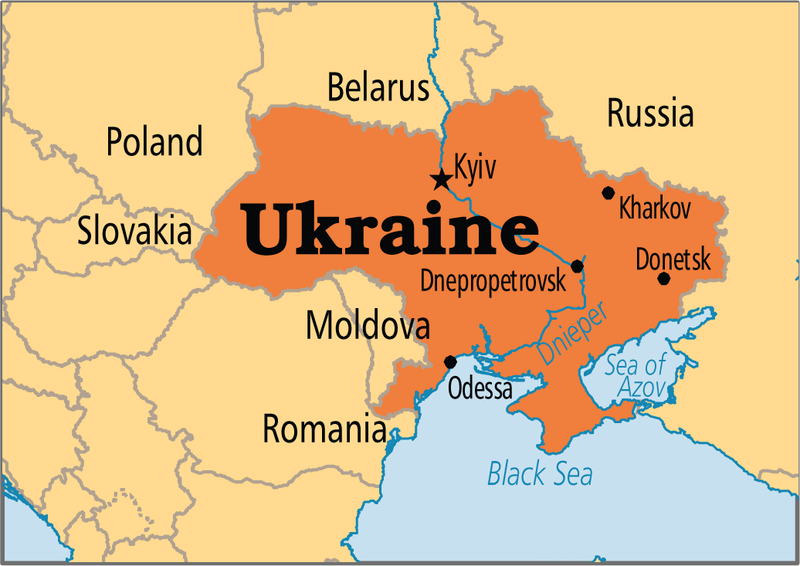 It is also possible that Russia will intervene militarily if President Putin fears losing Ukraine to the West. An invasion from Russia, however, could backfire. The reality of massive pro-EU demonstrations contrasts sharply with disillusionment directed toward the EU in western Europe. Ukraine successfully joining the organization will give the others a boost – showing that the ideal of European unity is far from dead.